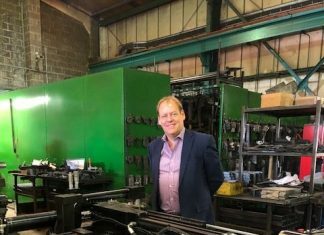 Five Yorkshire businesses are at the forefront of the UK’s textile manufacturing boom thanks to their unique collaboration with a Kent-based farm. Romney Marsh Wools is sending fleeces from its flock of 1000 ewes to Yorkshire’s famous textile mills to be turned into throws, cushions, caps and even toiletries. The fleeces are processed and woven using traditional methods in West Yorkshire to create a unique, beautiful product range. Romney Marsh Wools also has a selection of indulgent toiletries made in Bradford using Lanolin from the fleeces. In true Yorkshire fashion, the wider range includes hand-made flat caps produced in Castleford by Lawrence and Foster. The firm’s growth mirrors that seen in the UK textiles industry, which has reported a 25% increase in production in the past year. Kristina Boulden, director of Romney Marsh Wools, said: “Wool is one of the few materials which is natural, renewable, sustainable and versatile. It has been our greatest pleasure to see the interest in British wool grow throughout our 10 years in business. The Yorkshire connection sees the raw wool fleeces traditionally cleaned by Haworth Scouring before being sent to Lightowlers Spinning Yarns in Meltham, Huddersfield. The wool is then sent a few miles over the hill to Townend Weaving in Slaithwaite. This year will also see new products for the Romney Marsh Wools range which include Lanolin lip balm, a special edition King Size throw and exciting gift options such as hot water bottles and knitting kits.